In my previous post, I gave an overview of why Brightcove thinks dual screen apps are a space worth watching. If you’re a consumer, they offer a potentially more engaging content experience. If you’re a content producer, then they are both an opportunity to recapture your increasingly distracted audience and a way to deepen your relationship with your engaged audience. In this post, I’ll take a deeper look at the technology that underpins Apple’s dual screen strategy. In order to plot Apple’s dual screen direction, you need not look further than AirPlay, its proprietary media sharing protocol. For years, Apple has claimed that the Apple TV is merely a “hobby,” yet despite its modesty the company has quietly been building a powerful platform that is emerging as one of the best positioned in the march toward dual screen apps. Every major Apple device now has AirPlay built in and can share media with the Apple TV. It’s clear that Apple hopes to use its installed base of devices as a launching point for its dual screen strategy. Let’s take a look at AirPlay from the perspective of the four pillars I noted in my previous post: technology foundation, ease of use, interoperability, and developer enablement. From a technology point of view, AirPlay is similar to standard protocols such as DLNA (Digital Living Network Alliance). “Sender” devices (iPods, iPads, and OS X computers) can connect to “receiver” devices (AirPlay-enabled speakers or an Apple TV) and play media over the wireless network. 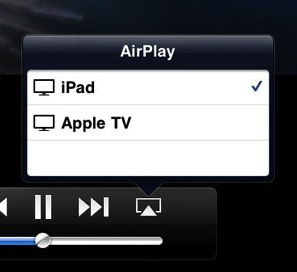 However, AirPlay goes beyond just media sharing. Mirroring also allows the device to project its screen to the receiver device. Still relatively untapped, this capability has been used in some games, notably Real Racing 2 HD. Within Brightcove App Cloud, we’ve used this capability in our dual screen APIs to enable apps that project two application screens simultaneously -- one on the TV and another on the device. AirPlay devices automatically discover each other over the LAN then use a variety of ports to communicate. In most cases, these ports are open on consumer routers, but many corporate networks are sufficiently locked down to prevent use of AirPlay. From a content point-of-view, AirPlay’s biggest technical weakness is that Apple TV does not support any third-party DRM technologies. Apple TV can play back encrypted HLS streams, but while an iOS app can use technologies like Widevine or Microsoft’s Smooth Streaming those streams cannot be passed to the Apple TV. This is most likely a business decision by Apple but it makes the platform less attractive if you have invested in other ways of protecting content. From a consumer point of view, Apple has made AirPlay very easy to use. Among Apple’s devices, interoperability is excellent, especially when compared to the fragmentation that has hampered DLNA adoption. Keeping with Apple’s general design philosophy, there are no settings to configure; it just works. Devices automatically discover each other on the same subnet, and the sharing control automatically appears on its audio and video players, as well as on the lock screen. This ease of use has helped accelerate use among Apple devotees. At the same time, Apple’s biggest weakness in driving adoption of AirPlay is interoperability with non-Apple devices. While Apple has licensed the audio portion of AirPlay to several device manufacturers, to date the only legitimate video receiver of AirPlay is the Apple TV. And despite recent success, its installed base of ~7 million units is dwarfed by the likes of Microsoft’s XBox (66 million) or by smart TV manufacturers like Samsung or LG. To compete effectively, Apple will have to create even more demand for its $99 “puck,” or change direction and agree to license its protocol to third-party device manufacturers. Developers will be key to driving more demand for Apple TV. Developers have played a huge role in the success of the iPhone and iPad, creating over 700K apps. Apple is now making efforts to empower them to use AirPlay, adding dedicated documentation for iOS developers and web site creators, and expanding the APIs to support more use cases. If developers take to AirPlay, Apple will have a huge advantage in driving consumer adoption of Apple TV given its large installed base of iPad and iPhones. In sum, Apple has built an incredibly powerful platform with AirPlay, but it needs to accelerate adoption among developers and drive market share of Apple TV if it hopes to capitalize on its initial device lead. As I’ll discuss in my next post, Apple’s competitors aren’t standing still and have advantages of their own they hope to exploit in the battle for dual screen dominance.